Anybody still waiting for The Pivot to a “presidential” version of Donald Trump? As recent events again have shown, you’re more likely to see him with a crewcut. Today’s Trump is pretty much a carbon copy of the guy who appeared before a hotel ballroom full of TV critics 10-and-a-half years ago during NBC’s portion of the annual winter network “press tour.” Not only that, but son Don Jr. and daughter Ivanka joined him onstage for what may have been the trio’s first and still only joint press conference. The Television Critics Association, of which your friendly content provider is a longtime member, has transcripts dating to the winter 2005 tour. Sifting through them, I hoped to find a Trump appearance on behalf of The Apprentice. Eureka, it occurred in January 2007, with papa Trump holding forth with the show’s new “boardroom” advisors, Don Jr. and Ivanka. This turned out to be a last-ditch effort to save the original, conventional version of The Apprentice by originating it from Los Angeles for the first time and also changing up the format. But this sixth edition flopped in the ratings, drawing the show’s smallest audiences to date. 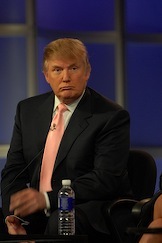 It prompted the emergence of The Celebrity Apprentice in 2008. The future President (and no one on planet Earth envisioned that) exhibited all of the traits he’s since deployed in the Oval Office. He exaggerated, meandered, self-aggrandized, boorishly entertained and happily rekindled his latest feuds when asked. At the time his targets were Rosie O’Donnell and Barbara Walters of ABC’s The View. O’Donnell had ripped Trump for backing reigning Miss USA Tara Conner (he owned the pageant at the time) and giving her a second chance after she admitted to heavy drug and alcohol use while wearing the crown. O’Donnell slammed Trump as a hypocritical serial adulterer and “snake-oil salesman” who was anything but a “moral compass.” Walters sided with her, at least on the air. In private, Trump claimed she earlier had told him of her distaste for O’Donnell and plans to fire her soon. Of course these subjects came up anew, as Trump knew they would. He first gave O’Donnell the old wham-bam. Also true to form, Trump claimed sole responsibility for keeping The View afloat by calling attention to the show. Holding a train of thought, then and now, is not one of Trump’s strong suits. 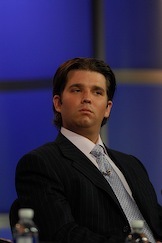 His two kids were more succinct at this particular session, with Don Jr. in particular speaking volumes after I dared to ask what he and Ivanka thought of O’Donnell. “She demurred -- “We’re not going to give a good ‘sound bite’ “ -- before Don Jr. chimed in. Dad readily agreed with a son who hasn’t changed a speck on that score. Whatever dad says or does, provide cover for him and fire back. Trump’s gut-punching tactics throughout the crowded Republican presidential primary elections were crystallized in this otherwise typically less-than-focused but telling observation. “I watched a politician this morning,” he began. “He’s announcing for President. And they were asking about somebody else that’s going to be running. And I said -- I just hate it -- I went to the Wharton School of Finance. I was a very, very good student, top student. And you know, so I understand like, life, and I understand also the academics. And I understand what I have to understand. “But I watched this politician. They said, ‘Well, what about your opponent?’ ‘Oh, he’s a fine man. He’s this. He’s that.’ Everything was perfect. I’m saying, ‘What the hell you going to vote for this guy for? Let’s vote for the other guy.’ It was called being politically correct. Less than a decade later, during Trump’s, name-calling, take-no-prisoners 2016 campaign, America was witness to Lying Ted. Little Marco. Low Energy Jeb. And finally, Crooked Hillary.